Yesterday I had the pleasure of chatting with the lovely Teang Tang, one of the two partners that own Ruby Woo, a whole new face in the bridal gown game. We met at Fashion Central's DeVille, she treated me to a Chai Latte and we got down to business...fun, pretty, silky white business. Ruby Woo is an extremely exciting concept. As you may assume, I am a big fan of Say Yes to the Dress, and one of the most voiced complaints is "I like the top of this one, and the bottom of this one". Well, in flies Ruby Woo to the rescue! They custom make intricate, ornate and couture gowns, made to the specifications of each and every bride, so it fits your body, budget and personality to a T.
When I say budget, how does $1000 flat sound? I know for a fact, to buy off the rack in Calgary you are usually looking at at least that amount, plus many more hard earned dollars on tailoring. Ridiculous right? These dresses are so gorgeous and they will make anything - bring them a picture of the dresses you like and in a few months, it's all yours! I decided to do a fun little interview with Teang about her company and the wedding dress business. B: "Teang, who in the world of wedding designers would you say inspires you most?" T: "Marchesa, we love Marchesa, hands down our number one favourite designer. Her pieces really accentuate the female form. The cut, is impeccable! For wedding dresses specifically we love Pnina Tornai, her pieces are wild and fun." B: "What trends are you seeing for 2011/2012 brides?" T: "We're seeing a lot of ballgowns, one shoulder and shorter dresses on the runway I personally love the shorter wedding dresses...they are fun and playful! B: "If you could dress any of the celebrity for her wedding, who would it be?" T: "Kate Middleton - Once pictures of her dress are released to the public, we'll be receiving requests for "princess-inspired" creations. Her dress will be popular in upcoming weddings." B: "Okay, that rolls into my next question, what are your predictions on Kate's dress, it's the talk of the town what style she'll be wearing". T: "I think she'll be in something form fitting, elaborate, a super long train...think Marchesa India dress." B: "What makes a Ruby Woo dress so special?" T: "It's made to fit every inch of your body, we make you look phenomenal! The inspiration behind our company is that little girl inside of you that imagines her wedding day. That little girl has this vivid image of a dream dress in her head but doesn't quite know how she's going to get her hands on it - Ruby Woo brings that little girls imagination to life". What a great idea, and a seemingly simple solution. I have high hopes for Teang and her partner Ivy Su. With everyone's busy lives and work schedules, blocking off hours of time for shopping and fittings sometimes isn't practical or possible. Ruby Woo to the rescue! Stay tuned - Monday, April 18th, we'll be announcing a contest that will earn you a chance to win the wedding dress of your dreams from Ruby Woo! 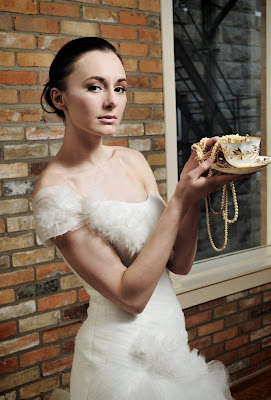 Dresses: Ruby Woo Wedding Couture Inc.
Love the article! Ruby Woo Wedding Couture makes me want to get married all over again-but to the same guy of course. Great blog, I'll refer to this blog from now on for all my wedding advice. Guess The Dress - A CONTEST!